Winter in the country is an amazingly beautiful season. The transformation of the trees and countryside with snow and ice is spectacular to behold – especially when you do not have to drive in it! I look forward to cutting wood in the fall and early winter, with thoughts of those future cold, quiet evenings when my family and I will be curled up, cozy next to a warm, roaring flame. But lurking unseen in this tranquil setting, there is a potentially silent danger. Every year, thousands of people are sickened, and some, unfortunately, die, from carbon monoxide toxicity. We have all heard the stories of people who are poisoned by faulty space heaters, or someone dying in a poorly ventilated garage while working on a vehicle with the engine running. Carbon monoxide is a colorless, odorless, tasteless gas that is highly poisonous. It is the product of incomplete combustion of organic matter, produced in the setting of an inadequate oxygen supply. Classic sources include older combustion engines without catalytic converters and other gasoline-powered equipment, especially in an enclosed setting, as well as heaters, some ovens, and poorly sealed or ventilated fireplaces. Since it is completely undetectable by smell or taste and does not cause any irritation when inhaled, the gas can build up in a space quickly to highly toxic levels. By learning and identifying the sources of production, as well as signs and symptoms of poisoning, treatments and, most importantly, prevention, I hope to help educate you in order to avoid unnecessary injury or suffering. But before that, I would like to present a general disclaimer regarding this article. The information presented here is for educational purposes only. I am giving you general medical symptoms and classical cases for your understanding. This is not for diagnosis, and certainly not for treatment. If you are suffering, or even if you are fearful that you are suffering, from any of the symptoms listed below, you MUST SEEK PROMPT MEDICAL ATTENTION. I want to impress on you the severity of carbon monoxide poisoning, and educate you as to what the signs and symptoms of toxicity are and might represent. It is up to you, however, based on your level of concern to act on that information in your particular circumstance. But after reading more about carbon monoxide poisoning, I hope that you will at least call a medical professional to explain your symptoms and get more information and instructions. If any doubt enters your mind, and you are worried about you or your loved ones’ health and well-being – please, please, please – go to an emergency room for evaluation and care. In life, and especially in medicine, it is always better to be safe than sorry, especially, as you will see, in this condition. Now, with that aside, let us return to our topic. In terms of pathology, carbon monoxide has its negative effects by competing with oxygen for the binding sites on hemoglobin (which has four sites to bind oxygen), forming a compound known as carboxyhemoglobin. Hemoglobin is the protein in red blood cells, or erythrocytes, which carries oxygen from the lungs and to the body. When compared with oxygen, the bonding affinity of carbon monoxide to hemoglobin is approximately two hundred times stronger. In addition to displacing oxygen, the carboxyhemoglobin also makes it more difficult for oxygen to be released from the other hemoglobin binding sites when the red blood cell arrives at the recipient tissue. Through these mechanisms, it inhibits oxygen transport from the lungs to the body. 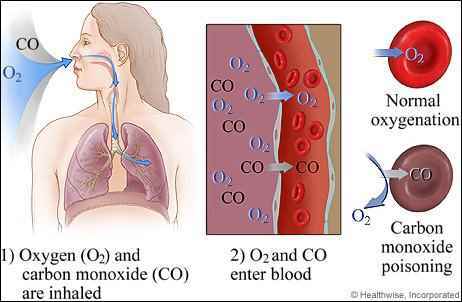 Unlike other causes of hypoxia, however, where patients have a dusky or bluish (cyanotic) appearance due to the absence of oxyhemoglobin, in carbon monoxide poisoning the oxygen is trapped in the hemoglobin molecule and carboxyhemoglobin is itself a bright-red color. Classically, it has been noted that patients suffering from toxicity can appear rosy-cheeked and have a healthy-looking appearance. In essence, however, regardless of appearance, carbon monoxide starves the body tissues of oxygen, leading to pathologic signs and symptoms of ischemia. The central nervous system, which includes the brain and spinal cord, and the heart are particularly sensitive to hypoxic conditions, and are predominantly affected by carbon monoxide poisoning. Acute side effects can occur within minutes to hours after exposure, depending on the concentration of carbon monoxide and the condition of the patient. Mild symptoms that can occur from minimal contact with the toxic gas include headache, dizziness and fatigue. Unfortunately, these are fairly nonspecific symptoms, and are often mistaken for a viral illness initially, especially during the winter months, when people are predisposed to exposure. In addition to illness, carbon monoxide symptoms can also be confused and misdiagnosed, depending on the presentation, as chronic fatigue, depression, or even migraine. At higher concentrations, carbon monoxide can cause confusion, altered sensorium, nausea and eventually coma and death, if not recognized, reversed, and treated in time. A major concern with acute carbon monoxide toxicity is its effect on the nervous system. Besides headache and fatigue, poisoning can impede higher intellectual functions, such as memory formation, and can also cause irritability. More chronic symptoms, which occur less frequently, but can be permanent, depending on duration of exposure, include amnesia, abnormal gait, dementia, and even blindness. Depression is another major concern in acute poisoning and can present in up to half of victims even a month after exposure. Older individuals, those who have lost consciousness when exposed to carbon monoxide, and people who have pre-existing neurological problems, such as a prior stroke or seizure disorder, are at increased risk for further neurological injury. Another group that is very susceptible to carbon monoxide poisoning are developing fetuses. Since the carbon monoxide keeps oxygen from being released from the hemoglobin molecule, it hinders transport from the mother’s lungs to the developing baby in the womb. Carbon monoxide can also cross the placental barrier itself, and cause direct effects on the fetal hemoglobin, which has an even higher affinity to it than adult hemoglobin. So even in mild maternal exposures, the fetus can experience significant toxicity, since elimination from the fetal tissue is slower than in adults. All of these factors result in profound fetal injury and death and makes it very important to monitor and avoid this situation if you are pregnant. Since carbon monoxide poisoning can mimic many of the signs and symptoms of other diseases, it is very important to at least think about it if the circumstances and symptoms are present and compatible. In terms of history, the most important factor is the potential exposure to a source of the gas. Classically, more poisonings occur during colder seasons, like fall or winter, and among lower socioeconomic classes, since people are inside more often in enclosed spaces with a heat source, such as a space heater, oven, or fireplace. Garages are also another area of potential exposure, since automobile exhaust contains significant concentrations. If you think that either you or a loved one is suffering from carbon monoxide toxicity, you need to vacate the area at once and seek medical attention. Immediate concerns are for people at-risk who are still in the area of exposure, as well as emergency response personnel, who may be put in harm’s way during a potential rescue attempt. That is why you must call 911 and wait for trained personnel with proper equipment (oxygen tanks and masks) to arrive. You do not want to become another victim. If it is at all possible, however, without endangering yourself, try to ventilate the area, to reduce the concentration of carbon monoxide, and, if you can (usually not, but just a point to consider), try to shut off or stop the source of toxicity. Initial treatment, which is usually administered by EMS and continued in a hospital setting, is one-hundred percent oxygen. Confirmatory diagnostic testing, in addition to symptoms and an identifiable carbon monoxide source, is also made at the hospital using a carboxyhemoglobin saturation monitor. The monitor calculates the differences in arrival time between reflected light waves emitted by the device. These differences correlate with the amount of carboxyhemoglobin relative to oxyhemoglobin present in the blood. Now just as interesting, and important aside – cigarette smoke, in addition to all the other numerous carcinogens and toxins, also includes carbon monoxide. This can lead to blood concentrations up to twice the level of normal, and should be kept in mind when a patient is interviewed and treated. Standard pulse oximeters, which are present in most emergency rooms and hospital floors, cannot accurately measure the difference between the two molecules, and falsely report a normal or even elevated level of oxyhemoglobin in the bloodstream. It should be noted that people arriving with the symptoms and a history consistent with exposure to carbon monoxide, who have normal carboxyhemoglobin levels, may still have been exposed. They should still be treated as if they were suffering from carbon monoxide toxicity, especially if the patient is pregnant. By giving pure oxygen, the increased concentration helps compete with carbon monoxide for hemoglobin binding sites. It actually reduces the half-life of carboxyhemoglobin by a factor of four. However, it must be remembered, as stated earlier, that pregnant women need to be treated longer than other patients due to the increased susceptibility of the fetus. The mainstay of therapy for carbon monoxide poisoning is hyperbaric oxygen. In this treatment modality, patients are placed in a hyperbaric chamber and subjected to several times greater atmospheric pressure than normal in the setting of one-hundred percent oxygen. The pressure chamber is essentially the same as that used in treatment for nitrogen gas toxicity (also known as decompression sickness or “the bends” for divers) except that the increased pressure is the main therapeutic factor for decompression sickness. On the other hand, it is thought that hyperbaric treatment with oxygen helps to dissociate the carbon monoxide from the hemoglobin molecule even faster than oxygen at normal atmospheric pressure. It may also help supersaturate the bloodstream, and facilitate the transport of oxygen to the tissues in the blood plasma itself, bypassing the poisoned hemoglobin molecule. Other than increased oxygen concentrations, there is no other specific treatment for carbon monoxide poisoning. The rest of the medical care consists of supportive treatment, which is essentially managing other symptoms, such as respiratory distress, hypotension and neurologic damage. Perhaps the most important piece of information regarding carbon monoxide is prevention. Detection is the key to avoiding injury or death, and staying out of the hospital or needing hyperbaric treatment. Public health measures have come a long way in educating the public about the risks and symptoms associated with toxicity. It has become the law in many states that houses be equipped with carbon monoxide detectors, in addition to smoke detectors. Both of these detectors save lives, and they should be on every floor in a home. 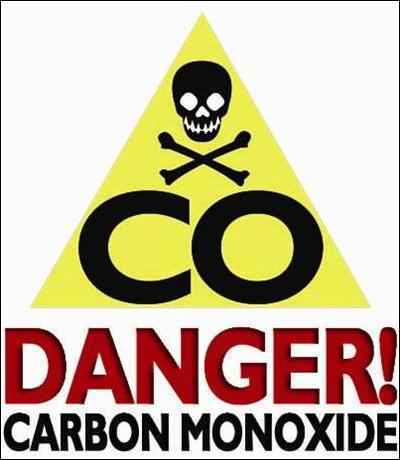 Carbon monoxide poisoning is insidious and claims too many lives every year. In order to protect yourself and your loved ones, it is important to learn the source of the gas (faulty combustion sources, such as engines or fireplaces), as well as the classic symptoms. Unexplained headache, fatigue, nausea, depression, and confusion should prompt questions and investigation, to make sure that chronic poisoning is not occurring, especially in pregnant women. And, most crucial, carbon monoxide detectors need to be in every home, in order to warn and protect against poisoning, keeping us safe as we enjoy those quiet evenings by a roaring fire.